I went to Wal-mart today looking for craft paint. Found a book, not unusual. What is unusual is I'm supposed to read it on October 8, 2009. 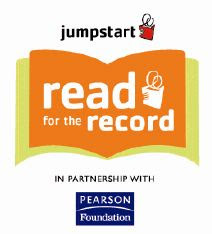 Since its inception, Pearson has proudly presented the annual Jumpstart Read for the Record Campaign, encouraging more than a million people since 2006 to help set a new record each year for the world’s largest single-day book reading. In the process, we’ve been helping to make sure that all young people across the United States have an equal chance to begin school with the literacy skills they need to succeed. On October 8, 2009, we aim to double that number in a single day. Together with record-setters everywhere we’ll be reading The Very Hungry Caterpillar, by Eric Carle. In addition to hosting reading events with friends, colleagues, and educators from around the world, we aim to raise funds to support Jumpstart’s essential year-round work with preschool children in low-income communities across the United States. Check out Read for the Record to sign up so your read counts and if there is a Wal-mart near you, they're selling a special edition of Eric Carle's The Very Hungry Caterpillar, or head to your bookshelves for your copy! Sounds fun! Wish they had something like that round here. I still have my copy of The Very Hungry Caterpillar! Very good idea to support children in low-income communities. I love it when publishers do this - reading brings so many people together.